It’s an EP. You’ve got six songs to let the world know how good you are, so you have to grab the listener right from the start and that’s exactly what Velvet & Stone have done here. The first song, “Fisherman’s Blues”, opens with a combination of fiddle and Dave Gilmour-like electric guitar before settling into a more reflective verse pushed along by the bass line and decorated with a descending piano line that could have come from “Riders on the Storm”. But I suppose you want to know about Velvet and Stone. OK, here we go. Lara Snowdon, Holly Jo Gilbert-West and Kathryn Tremlett met in a Devon pub less than two years ago (what is it about Devon at the moment?) and within a very short time won a recording session at the wonderful Convent studio and venue complex as a prize in a singer-songwriter competition. And that’s where they recorded the six songs on this EP, with some help from Ben Nicholls and Andrew Tween (bass and drums) and producer Jack Henderson (also playing guitar and keyboards). The additional musicians have added some deft touches, embellishing without overpowering and leaving the songs plenty of room to breathe. Lara and Holly have the classic mix of voices, one pure and clear the other slightly more unconventional with a hint of Bjork, and have a folk background in common, while Kat brings her classical influences to the mix: someone also managed to sneak a bit of jazz in there as well. Despite the variety of instruments on the EP, the songs never sound cluttered and the vocals are always allowed to shine through, creating ethereal musical dramas. “Forget About the Rain” has a hypnotic Celtic feel with some very melancholy violin, “Patchwork” contrasts an almost military drumbeat with piano and violin fills and ethereal vocals and “Same Old Record” has a gypsy jazz feel emphasised by the walking bass and violin while “That Road”, backed mainly by acoustic guitar evokes the Bill Withers classic “Ain’t No Sunshine” taken at a slower pace. The title song builds gradually with rolling piano thunder and swirling violin rain before reaching its peak and slowly fading away; it’s about a real storm, but it’s a metaphor for something on a more personal level as well. As a sampler, this ticks all the boxes. There are six strong songs, the stylings are varied and the two voices are excellent whether they’re singing together or solo; you can’t ask for much more than that. And the Devon thing? 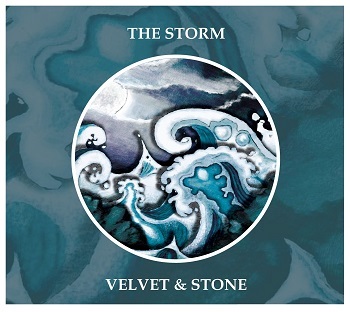 Velvet & Stone have already supported those Riot Squad favourites Sound of the Sirens this year and it looks like it might be their turn to break out now. “The Storm” is released nationally in the UK on Friday April 18th.